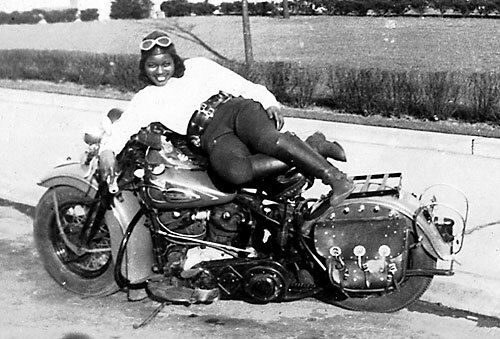 Bessie Stringfield on one of her 27 Harley Davidson motorcycles she rode over a 70 year riding career. ills and can-do attitude, she also performed trick riding in carnival stunt shows. 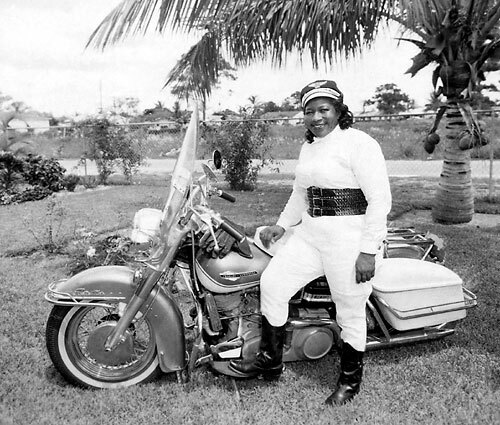 During World War II Bessie worked for the Army as a civilian motorcycle dispatch rider. The only women in her unit, she completed rigorous training maneuvers. With a military crest on the front of her own blue “61” Harley, she carried documents between domestic U.S. bases. Bessie encountered racial prejudice on the road. On one occasion she was followed by a man in a pickup truck who ran her off the road, knocking her off her bike. She played down her courage in coping with such incidents. “I had my ups and downs,” she shrugged. Late in life, Bessie suffered from symptoms caused by an enlarged heart. “Years ago the doctor wanted to stop me from riding,” she recalled. “I told him if I don’t ride, I won’t live long. And so I never did quit.” Before she died in 1993, at the age of 82, Bessie said, “They tell me my heart is three times the size it’s supposed to be.” An apt metaphor for this unconventional woman whose heart and spirited determination have touched so many lives.